Honestly, I don’t even know what to call this tomato sauce. There are so many wonderful things about it, I can’t decide which to highlight! 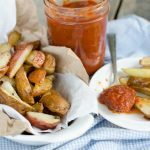 Let’s just say, it’s everything I’ve been looking for and want in marinara sauce recipe from fresh tomatoes! But first, let me tell you what I HATE about using tomatoes fresh from the garden for sauce-making. Every year, I gather pounds upon pounds, bushels upon bushels even of tomatoes I’m hoping to preserve for our use for the 9 months out of the year when there aren’t fresh tomatoes to be had. And every year when I’m done, it never fails to drop my jaw at how very few pints of sauce can come from tens of pounds of tomatoes. I want to think that last time I had froze something like 70 pounds of tomatoes and ended up with 6 pints of sauce! It was something ridiculously crazy like that. And how do you even get to that point? Why by baby sitting a pot of tomatoes as they simmer the water away for hours and hours on end! ‘Twas a hopeless task I dreaded. With our growing family, it seems virtually impossible to grow enough tomatoes to even consider putting up enough for the year. So much so, that I gave up. I think we had homemade spaghetti sauce 3 or 4 times last year, if that. And by homemade I mean I busted out the Hunts sauce, puree, and paste, a little sautéed onion, some herbs and spices, a bit of sweetener, maybe a pound of ground beef. Point being, I scaled by my expectations and the New Plan was to make the majority of the pizza sauce for a weekly pizza night. Forget pasta sauce. Now I look at those little 6 ounce cans of tomato paste that are sold for less that a buck and marvel at how they can afford to do it. There’s gotta be, what, 30 pounds of tomatoes in that bitty can? Like with so many things, I didn’t know the true value of what went into a product until I produced it myself! So that’s what I don’t like about traditional tomato or spaghetti sauce. 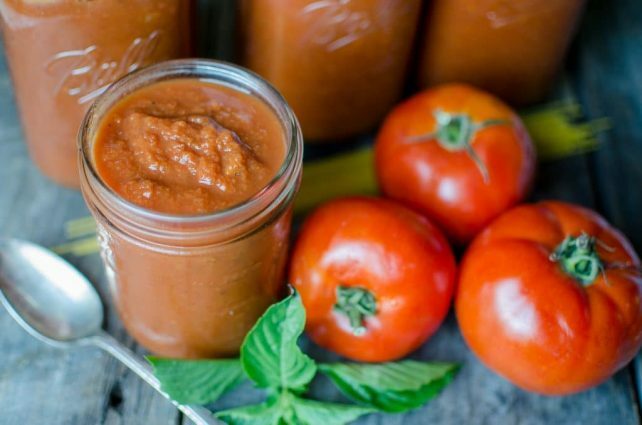 Now let’s get back to the sauce at hand and the fact that I have discovered the most quick and simple way to make a garden fresh marinara sauce recipe…. and it even tastes good! Less than 10 minutes invested into the finished product!! It makes 3 QUARTS of sauce!!! Yes- 6 pounds of tomatoes yields 3 QUARTS of sauce. Can I Can This Tomato Sauce? Now, I know what you’re thinking. That’s all well & good Quinn, but can you can it? Well, since it’s not an official, scientifically tested, government certified and inspected recipe, I can’t recommend that you do. For safety’s sake, of course. Are you wondering if it’s watery? I was too. I always find that the marinara sauce recipes from fresh tomatoes are a more watery than their Cooked-Down-All-Day-And-Then-Some counterparts. The answer is, a tiny bit, but it’s not too bad! Since I’m canning it, I wouldn’t want it to be any thicker for safety reasons since the heat won’t be able to as fully penetrate the sauce. If it’s too much for your preference, don’t despair. You have options. 1.) Cook it down some more just before you’re ready to eat it. A low simmer for an hour or so really oughta take care of it. 2.) Add in some tomato paste or tomato powder. This option is quick, but it might mess with the flavor. 3.) 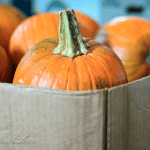 Attainable Sustainable has found this trick using a strainer and a turkey baster. Clever! I’ll be trying this! 4.) Use tomato powder to thicken it up. The last time I made this sauce, I actually forgot the carrots. Don’t ask me how, there’s like 5 ingredients to remember, but I did. The sauce? Like water. The carrots are the secret ingredient that makes this sauce thicken up so nicely! How Do I Get Rid of the Tomato Seeds & Skins? Perhaps wateriness isn’t your concern. Maybe you’ve noticed and are wondering about why I’d leave the seeds & skins in there. Well, the original recipe said to do the whole dip the tomatoes in boiling water to slip off the skins trick. I hate doing that, so I didn’t. The seeds & skins surely have some nutritive value anyway, right? 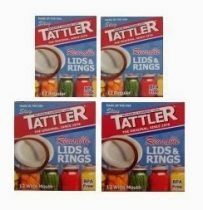 If you didn’t want them in there, you could always do the Boiling Dipping Trick or make quick work of it with a food strainer. Can I Add in Other Ingredients? I know you’re wondering too whether you can add in your own favorite ingredients. Sure. Of course you can. This sauce would be a wonderful way to hide a multitude of vegetables. Fat, overgrown zucchini. Trick the picky mushroom haters with it. But I must give you two warnings. Secondly, and seriously, please freeze your sauce instead of trying to can it if you add in any other extra vegetables. Better safe than sorry. One other thing I’ve got to mention. There is a way to make this sauce more rich and delicious, even more nutritious. But it’s kind of strange if you’ve never done it before. If you have, you’ll never consider skipping it again. Chuck in a big ole’ hunk of beef bone. Whether it’s shin bones, ribs, or leftover scraps from a wonderful steak you had last month, the acidity in the tomatoes will draw out the goodness and flavor from the bones. Chunk up the tomatoes, carrots, and onions and toss them into a large slow cooker. Add the garlic, wine, salt and pepper, and bones to the slow cooker. Cover and cook on high for 6 hours or on low for 10 hours. Remove the bones if you used them. Stir in the oregano, basil, and olive oil. 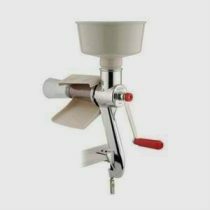 Puree the vegetables with an blender, food stainer, foley mill, or stick blender. Serve immediately, freeze, or can. Ladle into clean, hot jars. Remove the air bubbles with a plastic utensil. Clean the rims with a clean, wet rag. 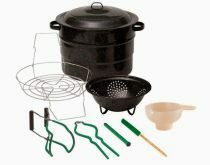 Add to the pressure canner and continue according to manufacturers instructions. Thoroughly stir in the citric acid for a couple minutes and then retest. Lower into boiling water bath canner water. Resume the boil and then begin the timer for 40 minutes for quarts. Test the seal 24 hours after removing from the canner. Thank you, Quinn! I can’t wait to try this! Oh, and I had wanted to purchase the bundle and almost forgot until 10:00 last night! I ordered it through your link up above. I can’t wait to start reading and learning! I just use cheap cooking wine. Quinn At ReformationAcres … lol …. I went to the store … and bought some Melbec….. since I like it:) ….. It in a hot water bater right now …l did pints. This is just the best stuff ever! I've been freezing it in old tomato sauce jars since I don't have pH strips and I'm nervous about canning them, but I will try it next year when I get my pH act in gear. Thanks so much! Quinn, this is awesome!!!! Batch #3 is in my crock pot and I've been sharing this recipe with everyone and anyone I know who has a garden. Thanks to you, it's homemade sauce this winter, not ragu! Yea Megan!! I'm so glad you like it so much! That's what I found over the winter as well- it's incredibly versatile! I used it everywhere and for the first time ever was able to have sauce last almost all the way to tomato season. It's a life changing recipe! So glad you love it! I’ve made this sauce several time in the last couple months. I love how easy it is… Our freezer is now full of it! We love it. Thank you for the recipe!!! You’re very welcome Karen! We’ve had a rough time with chickens (and oddly enough our cats) eating the tomatoes right off the vine. We had our first killing frost this morning and I couldn’t help but take a moment and be overwhelmed with gratitude because of this recipe. We still were able to put up 37 quarts of tomato sauce because the yield is so high. I’m so glad that you love it too! Do you think this would work with cherry tomatoes? I have a TON in the freezer from last year! Totally works with cherry tomatoes! Most of my sauce this year was cherry tomato sauce thanks to the chickens wolfing down all my heirlooms. Quinn Veon thanks so much. So excited to try this out! 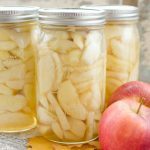 What would be the time for pressure canning pints be if quarts are 25 minutes? I'm curious to know how the freezing worked. I HATE canning! Love my freezer! It would be 5 minutes less so 20 minutes for pints. Reformation Acres Thank you for answering my question. The sauce is fantastic! Next year I hope to put up more than this year. I have some whole frozen tomatoes from last year. Could I use those instead of fresh? 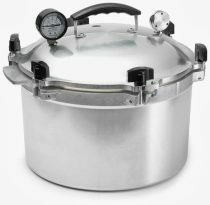 Why the concern for pressure canning? 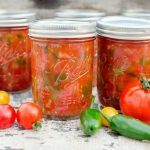 Doesn’t pressure canning work specifically for low acid foods like meat and corn? I thought that is why you pressure can, but I am new to it, so I might be wrong. You’re totally right, but since this isn’t a “professionally” tested recipe, I simply wanted to make it crystal clear since it is a food safety issue. I’ve already got folks in these comments treating me like an idiot and calling me irresponsible. Quinn, is this recipe for frozen (and thawed) tomatoes, or only for fresh? I ask because quite a lot of extra liquid comes off frozen tomatoes after they thaw, so it would make a difference. The tomatoes I’m using this year are pretty watery compared to the ones I’ve used in the past (which is a shame because they are so abundant!) and what happens in the crockpot is the water separates so I’ll just ladle it out before pureeing to make sure it’s thick. I haven’t tried it with frozen ones yet (though I did freeze some this year to experiment with.) I imagine that it will work out just the same as my watery fresh ones. You need to stop "not recommending" this for water bath canning. Please take that part off of your page. You have meat bones and oil in this recipe. Both are dangerous and should NEVER be on the ingredient list for water bath canning. For pressure canning -> sure, you haven't had the recipe officially tested, but the canning time seems alright, so, feel free to "not recomend" that. You have a responsibility if posting canning recipes to have a fraction of a clue what you are talking about. Can I make this without the wine? Wine isn’t allowed in my diet right now. Will leaving it out affect anything? Should I try to substitute something else in its place? Also, can you tell me a little more about doing the ph test and knowing when to add citric acid or lemon juice? 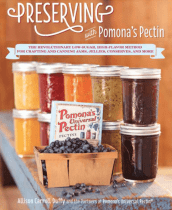 I’m fairly new to canning and have never heard about this before? As a fresh recipe, the wine is simply going to add a depth and boldness to the flavor. I would just leave it out then. Though I’m not sure canning it without the wine is a good idea. The wine will help to acidify it and make it safe for canning. I would suggest anyone add the citric acid just to be safe. 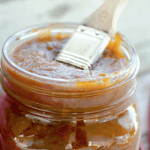 I did used to use the paste-type tomatoes such as San Marzano or Amish Paste. Still a lot of cooking down, stirring, and babysitting. And to be honest not a whole lot of flavor. With this recipe I don’t have to any babysitting/stirring. I can grow separate tomato varieties for fresh eating and canning, plus the mix of heirlooms and sweet cherries makes the most delicious and flavorful sauce- I don’t even bother to use herbs half the time. It’s that good on it’s own. A little confused. Am I supposed to puree with seeds & skin or put through food mill. While describing the dauce you say to puree but directions say food mill is an option. What would that do to the final yield?